One of Columbus’ finest vocalists will be honoring one of her heroes this weekend. 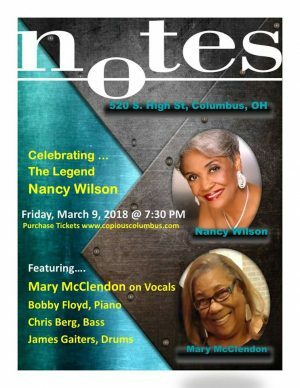 “Celebrating the Legendary Nancy Wilson,” a concert featuring vocalist Mary McClendon joined by Bobby Floyd on piano, Chris Berg on bass, and James Gaiters on drums, will take place at Notes on Friday, March 9th at 7:30pm. Doors open at 6:30pm – tickets and more details are available here. Wilson, a native of Chillicothe who grew up in Columbus, went onto fame as a versatile song stylist, actress and entertainer – Learn more from her Wikipedia page. Coming from a similar background, McClendon has been a respected vocal and artistic talent in the area for decades and has collaborated with countless jazz legends. As Wilson said, “Mary is keeping with the tradition of caring for the music I kept close to me, for so many years.” For Friday’s performance, McClendon and her all-star band will pay tribute to Wilson in conversation and songs, with a program that includes favorites like “Guess Who I Saw Today,” “Happy Talk,” and “The Very Thought of You.” I was fortunate to have the chance to talk to McClendon last week about the show – Keep reading for her thoughts on this special performance. Your Nancy Wilson tribute looks excellent! What inspired you to put this show together? Mary McClendon (MM): I’ve admired Nancy her entire career, first of all, and we go back quite a few years. [There’s] a lot of things that happened along both of our musical journeys that made me remember her, what she had done, and what she was doing. We’re both Southern Ohio girls. I started my one-woman shows when CATCO first approached me to do “Lady Day at Emerson’s Bar and Grill,” the story of Billie Holiday. From there, I’d done tributes to different people, but really got involved with it last year when I did “To Ella, With Love” [her tribute to Ella Fitzgerald] because it would have been her 100th birthday. So I did that to a sold-out audience at Natalie’s, and was really happy, humbled and grateful to do that. But in the back of my mind, I kept saying, “I gotta do Nancy, I gotta do Nancy.” So that’s how it culminated in me putting ideas together and fact-checking things I had known over the years. Are you in contact with Nancy? MM: I am not in contact with Nancy, and the ironic thing is I only met her for the first and only time maybe 15 years ago? She was here for an Alzheimer’s fundraiser and I got to go backstage and meet her. But the interesting thing, and I don’t include much of this in my storytelling tribute, but my very first job was with Motorists Mutual insurance company downtown. It just so happens that the job I got was the job she had before she relocated to New York. [Laughs] I went into Motorists Mutual, this kid right out of high school, and right away people kept saying things: “Do you know Nancy Wilson?” “No.” “You look like Nancy Wilson.” “No I don’t, but anyway, thank you.” But Motorists Mutual had a company choir and we traveled around the state and played local events. I joined the choir, and people used to say I sounded like her. And then, her signature song “Guess Who I Saw Today” happened. And I just fell in love, right then and there. “I love this song, I love how she sounds,” that kind of thing. So that’s traveled with me all these years. Do you have any favorite memories of seeing Nancy in concert? MM: I saw her perform locally a couple times, most of her songs I love – her style and what she does with them. Of course her signature song “Guess Who I Saw Today” was probably one of the first ones I did as a solo in my professional performances. That remains one of my all-time favorites and I love her doing that. And she tells the story – she always tells this funny little tag before she begins the song. It’s really cute. She’s the ultimate storyteller. All of her songs tell a story. Even when you read about her, they call her “the complete entertainer.” I agree with that. She can do any type of song, and she really is dramatic in what she does. Can you tell me about what you have planned for Friday? Not just songs, I take it, but also telling stories? MM: Yeah, it’ll be just [some] stories. I don’t want to include too much of myself, but some of that will come up. She was born in Chillicothe, Ohio – I was born in Portsmouth, Ohio [about 50 miles apart]. She’s a few years older than me, but she graduated West High – I graduated Marion-Franklin. I started singing as a little girl – so did she, all the way through high school. The difference is, I didn’t start singing right out of high school – I got married and had 3 kids. She went onto become quite a success. I know the local musicians she worked with here in town, and I went onto work with them. [There’s] just certain little things that I find interesting, especially after researching the Ellas and the Billie Holidays. I always find it, not shocking, but their life stories were practically the same. And I just say, “Is that the time period? Is that the way things were?” [Ella and Billie] both had tragic childhoods, they were basically street performers. But when I researched their lives, it’s just almost the same. I find that quite interesting. [She wonders] “Is all of this true? Is any of it true?” But when I look at Nancy’s life, and I compare my own, there’s just so many similarities. So that’s the interesting part. I’m looking forward to it. I’ve got Bobby Floyd on piano, I’ve got James Gaiters on drums, and, just recently, Chris Berg [on bass] – I had Jeff Bass, but he broke his hand a couple days ago. So Chris Berg has accepted our invitation. That’s definitely a great band. I’m sure they’ll be great at interpreting these songs. MM: I’m sure they will, I’ve got them listening to them now. “If you don’t do anything else, just listen to her.” And when we get together for our rehearsal, I’ll have the charts and we’ll go from there. Nancy just celebrated her 81st birthday – She was 81 on February 20th. She’s not performing anymore, and I don’t think she has in a long time, because she has some health issues. I do keep in touch with Georg Hill, a young man from here who lives in Colorado – he is her “artist representative,” I think he keeps her website up-to-date. He knows I’m doing the show, and he gave me a quote from her [above]. I talk to him on occasion. He heard me do “Guess Who I Saw Today” when they gave Nancy a star at the Lincoln Theatre Walk of Fame. So she has a star there, and I performed for that. They honored Nancy, Bobby Floyd and Carl Sally that day [in 2015]. Georg was very complimentary after that, and I kept in touch. Do you have any other thoughts about the show? MM: She had a lot of fame and fortune, but it was so long ago. I don’t want people to forget about her. In today’s culture, when I give vocal coaching from time-to-time and mention someone like a Nancy Wilson, these young girls – they have no clue. They know Beyonce.